4-H alumna Lauren Urton recently returned from the 4-H National Hall of Fame Induction Ceremony in Washington D.C. where she was selected to perform a unique musical rendition using American Sign Language. Urton grew up participating in numerous 4-H Clubs in Molalla and is currently attending Western Oregon University, where she is studying ASL Interpreting. Each state has the opportunity to nominate one current or college-aged 4-H member to perform at the national ceremony every year. It is a great honor to be nominated according Wendy Hein, 4-H Youth Development faculty with the Oregon State University Extension Service in Clackamas County. 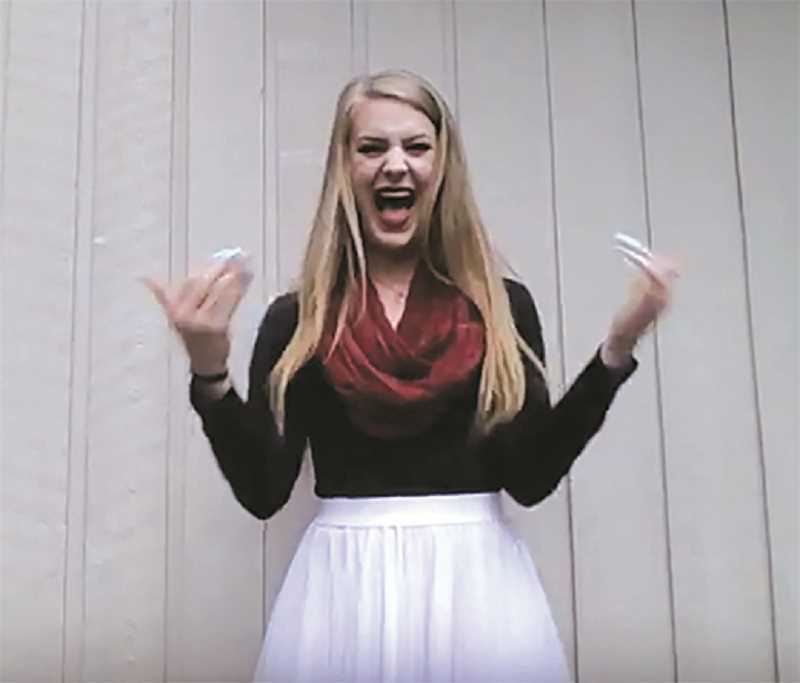 "I saw Lauren's musical performances in American Sign Language several times as a 4-Her at the Clackamas County Fair, where she blew everyone away," said Hein, who nominated Urton to perform. "She does far more than simply translate the lyrics into ASL. When she signs a song her whole body is engaged. Her face lights up with emotion. The audience is drawn in. It is a unique kind of musical performance that connects with everyone from the front row to the top bleacher." Urton compares her musical ASL performances to singing a song. "When you are singing or talking to someone you have a natural influx in your voice to express emotion," she said. "Same with signing, but since you are not using your voice you are going to use other things to convey emotion such as facial expression, your flow and rhythm, how big or small you make the signs; all characteristics in spoken language also have a way to be expressed in ASL." In 5th grade Urton learned how to finger spell, but she credits a Christian concert she attended in middle school with setting the course for her life. "I was just completely captivated by the performer's interpretation of the music," she said. "I couldn't look away and in that moment I felt God telling me, 'This is what you are going to do some day.'" Urton joined Clackamas 4-H as a Cloverbud and spent 12-years exploring a number of different 4-H projects, including Poultry, Small Animals and Performing Arts. She was also a youth leader, according to Hein, "mentoring her four younger sisters who she continues to assist." "4-H has played an incredibly huge part in my life and it has really shaped me in a lot of ways, including my personal and professional life," said Urton. "So it was really cool to be able to give this piece of me at the ceremony to honor all the 4-H members in that way." Urton plans to graduate in 2020 and enter the field of ASL interpreting. She is passionate about the deaf community, who she feels has been ostracized and misunderstood throughout history. "I don't want people to see me signing, but to see this amazing community with a lot to offer that I feel should be cherished, valued and acknowledged," she said.